Other uses: medicinal; industrial (flavoring) application citric acid. The lime is the smallest and probably most widely used fruit amongst the family of citrus. Lime comes from Southeast Asia. The name is of Arabic origin and it is believed that the Arabs most likely introduced it into India and Persia from where it was taken to Europe. Today it is cultivated in many tropical countries such as Florida, Brazil, Mexico and Egypt. 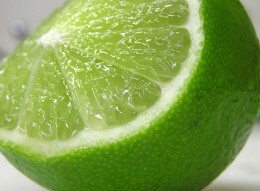 The lime is a small citrus fruit, like a small orange, with skin and flesh that are green in color. The pulp of the lime taste sour, and the fruit contains twice the amount of juice as the yellow, larger lemon. The juice, as a drink, makes one of the best thirst-quenchers. The acid content of lime is known to slow down the oxidation of fresh-cut fruits and vegetables, thus preventing discoloration and acting as a preservative. Lime contains by far more vitamin C than the lemon. A glass of warm water with lime juice and a teaspoonful of honey is an ideal remedy for cold and dry cough. Lime juice is a pep-up in cases of listlessness and a rundown feeling due to vitamin deficiency. The pectin content in fruit pulp is said to be beneficial in lowering blood cholesterol. The vitamin C content in lime increases the body's resistance to disease, aids the healing of wounds and prevents damage to the eyes. Vitamin C is also helpful in maintaining the health of the teeth and other bones of the body. It prevents decay and loosening of the teeth, dental caries, toothache, bleeding of the gums and fragility of bones. Lime is considered highly beneficial in the treatment of digestive disorders. 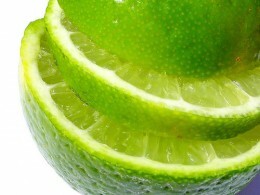 The lime juice is of great value in constipation, when it is taken first thing in the morning in a glass of warm water. The citric acid in limes has an alkaline reaction in the system which can relieve peptic ulcers. Few drops of warm lime-juice diluted with water should be instilled in the eyes in case of conjunctivitis. Its regular use with pure rose water in the ratio of 1:4 is helpful in preventing old-age cataract. Lime juice diluted in warm water was proven valuable in cystitis. It gives relief to burning sensation and also stops bleeding in cystitis. The lime juice is also excellent for weight reduction. Fresh juice' of a lime mixed in a glassful of water and sweetened with honey should be taken every morning on empty stomach in case of obesity. Lime contain limonene, this phytochemical are potent detoxifiers with anti-biotic effect that is protective against bacterial poisoning. The potent anti-viral properties in lime can kill cholera bacilli within a very short period of time. Drink one part juice and one part water regularly. Lemon peels when rub on dry or scaly skin can restore softness and add moisture to the skin. Make it a habit to add lime a sliced lime (together with peel) into your drinking water or juices, to enjoy all its medicinal properties. With lime in your drink, the absorbability of the other nutrients in your drink is increased up to five times! Use cut lime to remove: Onion and fish odors from your hands, knives and chopping board. Turmeric and ink stains from your fingers and nails. Precaution: Excessive sucking of fresh lime is also bad for teeth as the acid damages the delicate enamel of the teeth and makes them sensitive. Its excessive use weakens digestion. Lime is indispensable in industrial preparations of herbal ointments and cosmetics, its oil is used in soaps and shampoos, and it provides a major source for citric acid. Lime juice is part of ritual washing ceremonies, such as during wedding, in India and Malaysia.